Today, more than ever, it is pivotal that Stanford University reaffirm that commitment to humanity. With all the recent tragedies in the world, Stanford must stand strong and draw attention to the need for compassion both on campus and beyond. Compassion is already ingrained into Stanford’s approach to education, with empathy for the global community and compassionate action exemplified through centers like the Haas Center for Public Service and classes like the Design for Extreme Affordability course offered at the Stanford Hasso Plattner Institute of Design. Meanwhile, the Center for Compassion and Altruism Research and Education is working to investigate methods for cultivating compassion and promoting altruism within individuals and society through rigorous research, scientific collaborations, and academic conferences. The Charter for Compassion was born out of Karen Armstrong’s 2008 TED Prize wish. The Charter for Compassion is a document that transcends religious, ideological, and national differences. Supported by leading thinkers, including Archbishop Desmond Tutu, His Holiness the Dalai Lama, and Rabbi Awraham Soetendorp, from many traditions, the Charter activates the Golden Rule around the world. Our campaign’s mission is to commit Stanford University to a set of guidelines around compassionate action and intention to better help the university achieve its own mission, and to ensure long-term that Stanford University continues to realign and reshape those guidelines, along with its action, to reflect the basic principles of the Charter for Compassion: Justice, Equity, Peace, Respect, & Empathy. A special thank you to all our CCARE fellows that have manifested this project: Erica Knox, Annie Anton, and Tiffany Chhay! As part of the Stanford student group the Happiness Collective "HapCo" - Thomas and Maria went around Green and Meyer library pleasantly surprising people with warm cups of organic Echinacea tea. (January 2013). 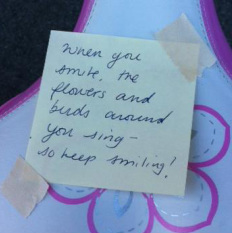 Random Acts of Kindness: This note was anonymously left on a bike for a Stanford student. (February 2013). As part of the wellness and Meditation class YES!Plus, students gave out fresh flowers and fruit to passerby's. (April 2013). Sign the Charter for Compassion! 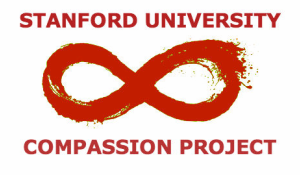 I support the Stanford Charter for Compassion! For further information, please contact the CCARE team at ccare_info@stanford.edu.